STOP PRESS! Northfields Way – the next step begins! Steve Pretty, Head of Planning, Transport and Engineering, Economy and Environment. Walsall Council. Laura Terry, Area Partnership Manager and friend of Clayhanger, has dropped this e-mail into madwblog’s inbox and it’s contents bring great news! Following the community consultation regarding the issues in Northfields Way I attach above for your reference the next release of information to the community. These letters will be distributed to all properties within the estate accessed via Northfields Way, in the first instance. We are able to share this freely electronically to communicate as far and wide as possible. I will be posting to the ‘Clayhanger has a Community Centre’ Facebook Page today, with the afore-mentioned letter drop tomorrow. The letter indicates that the formal posting of the TRO is likely to commence on 15 April, so we aren’t too far away from the statutory process, which has to run for three weeks minimum. I hope that you are able to share this with your community. The links below are the letter and plan Laura refers to in her e-mail and I would urge you to read them to fully understand the next stage. Thank you to all residents who took the time to go to the consultation meetings at Clayhanger Community Centre and the Methodist Church last month. Great things happen when many voices become one. 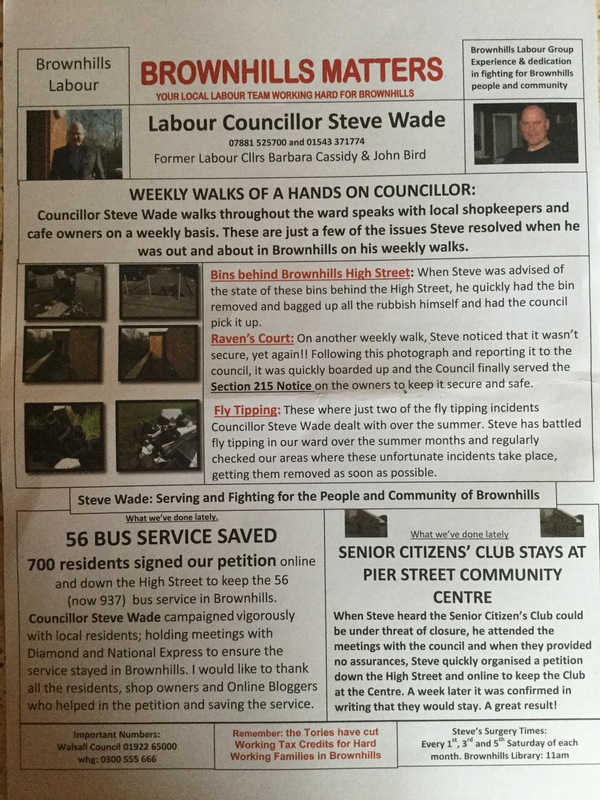 Just received Cllr Wade’s election leaflet which comprehensively sets out the hard work he has put into this area. 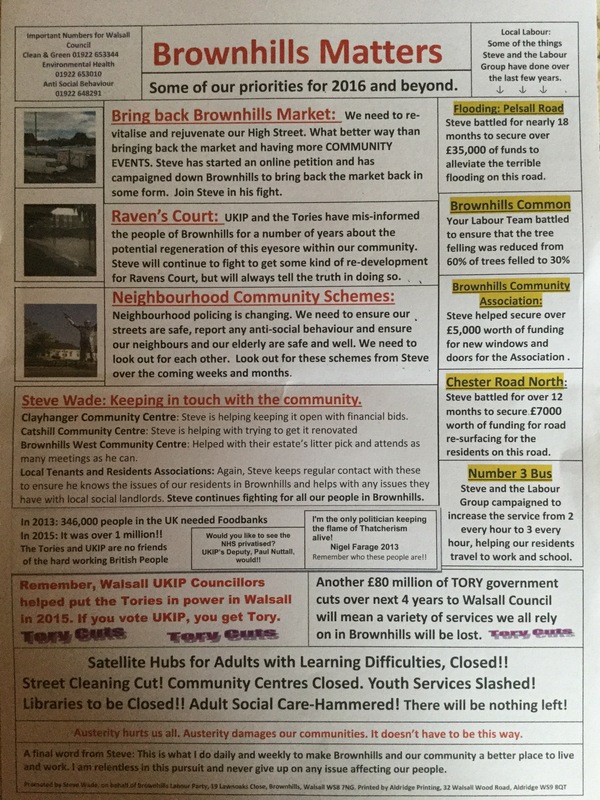 If you have an issue you want raised I would encourage you to get in touch with Cllr Wade or Cllr Ferguson. Don’t throw this away. Keep it somewhere you can see it. Collect others from opposing political parties and make an informed choice in May. Use your vote. I first noticed the little silver canisters in Clayhanger about a year ago. I didn’t think anything of them at the time. Casually mentioning them to my teenage children they were able to reliably tell me that they contain ‘laughing gas’ and that people use them to get high. On social media, there is much discussion about them. What are these canisters, what should we do about them and should we be worried? The little silver canisters contain nitrous oxide, more commonly known as ‘laughing gas’. This gas can be used in child-birth and also for dental procedures as it is a mild anaesthetic. It has the effect of feeling happy and relaxed, sometimes accompanied with a floating feeling and often the giggles. The effects are short-lived. Nitrous oxide was first discovered to have pain relieving properties in 1784 by Sir Humphrey Davy when it was then used as a pain relief in medical procedures but nitrous oxide use as a social drug is nothing new. In Victorian times ‘laughing gas parties’ were popular both in the UK and the USA. The little canisters containing nitrous oxide are used in catering for putting into devices which whip cream (like the type you might see used in popular coffee houses which also serve ‘deluxe’ hot chocolate and hence have whipped cream on top) and there are many household name suppliers on-line. The canisters are metal to preserve the gas under pressure and can be recycled. So cannabis is still a more prevalent drug which, judging by what I see and smell on walks with the hound around Clayhanger, I would anecdotally say that this is true. Nitrous oxide related deaths have been either 0 or 1 per year (with the exception of 2010) for 19 years up to 2012. A variety of national newspapers have reported on nitrous oxide canisters over the last twelve months and the feelings about them are very mixed. Depending on the press you read, you will get a different view and I would encourage you to read a variety to get a sense of the problem. I have, and I can say that there seems to be no easy answers. The product itself has a legitimate and safe use when used correctly. But, as with aerosols and glue back in my teenage years, it has a desirable side effect if you are seeking a high which, as with any drug legal or illegal, carries a risk. The nitrous oxide canisters are not being manufactured with the intention of providing a high, just as glue was not. But those knowing the effects of nitrous oxide have found a way to access it and use it for purposes other than those for which it was intended. It’s very difficult to apportion blame. Most of the sources below tell you EXACTLY how to use nitrous oxide as a high. So the press can be blamed for perpetuating it’s use too. How dangerous is laughing gas? BBC News. Is the growth in nitrous oxide misuse a laughing matter? The Guardian. Laughing gas is the party drug of choice for young people. The Telegraph. Hippy Crack Epidemic. The Daily Mail. Advisory Council on the Misuse of Drugs (ACMD) letter to Home Secretary and Secretary of Sate for Health. www.talktofrank.com advice on the uses and risks of nitrous oxide. As for the canisters in Clayhanger, it makes me sad when I see them. Sad because it means there are youngsters hanging out at night with nowhere better to be (I used to hang out as a teenager and secretly smoke Embassy Number One, but I always had somewhere better to be once I had consumed a packet of mints). Sad because of the litter and sad because there is no easy answer. If the laughing gas users are driven from Clayhanger, they will likely just go elsewhere. Clayhanger can’t see them then, so do they stop being our problem? Laura Terry of Area Partnership is collecting information about the prevalence of nitrous oxide use and has the happy job of counting canisters. If you find any, take a photo or count them and let Laura know where and when you came across them laura.terry@walsall.gov.uk. After that, personally I’d clear them up as safely as I could. 01922 648291 or email asb@walsall.gov.uk. Remnants of the railway line at Pelsall Old Railway Bridge. Image by madwblog. This post by Brownhills Bob caught my eye today. Like many who live locally, I use the railway line for leisure, although there are many who use it as a commute to work and to avoid the main road. It is thoroughly disappointing that Sustrans cannot see a way to open up the remaining stretch from Clayhanger to Brownhills. Even the graffiti has its place. Image by madwblog. Its a wonderful stretch of wildness pushed up against industry and urban life with many echoes of the past such as the old signal featured in Brownhills Bob’s original post. The old signal. It’s so photogenic. Image by madwblog. Clayhanger has shown that community spirit is strong – can you offer any help to Brian Stringer in getting a working party together to complete the cycle way? The Express and Star recently branded Clayhanger as a Beauty Spot which caused some to scoff, some to giggle and others to declare ‘quite right too’. I am in the latter category. I do think Clayhanger is beautiful. Not just visually, but the spirit of the community has beauty. To quote my 13-year-old daughter “Clayhanger becomes Clayhanger when the sun is out. Everyone comes out and you see people again who have been inside all winter.’ She’s right of course. The sun does bring us out. We tidy our gardens, take the dog on a long walk and stop to chat with neighbours. This community beauty was certainly demonstrated yesterday (Saturday 19th March) during the first of the community litter picks. Clangers old and new care about Clayhanger and are proud that it is essentially a pleasant and safe place to live. Not perfect at times, and unfortunately some do suffer at the hands of those who want to take what others have. Sadly, long gone are the days when anyone in any neighbourhood can leave the back door open and return later without fear of anyone having entered. Image courtesy of Brian Stringer, Local Historian and author of ‘Clayhanger Kid’, shared on Brownhills Bob’s blog. Somewhat ironically, it is well-known about these parts that Clayhanger used to literally be a dump. A landfill site. And it smelt. Awful. And there was a pig farm too. That smelt. Piggy. The combined effect was, so local legend has it, horrendous. An old aerial photo shared by Brownhills Bob, prompted much reminiscing. Fortunately, photos capture a visual moment, not a smelly one and so the stench is relegated to memory. Which reminded me that a friend of madwblog gifted some aerial shots of Clayhanger taken a few weeks back. This seems the perfect time to share them. Clayhanger looking south-east towards Shelfield, with Brownhills Tin Man island and the Activity Centre behind. Image kindly by P Hummings. The water in the top left corner is The Spot with the Old Village beyond. Top middle is the park and running from top right into the centre of the shot is Northfields Way and adjacent on the right is the field where ‘The Clayhanger Two’ occasionally reside. The ‘Westbury Estate’ is top middle with the ‘Bloor Estate’ hazily fading to the top of the image. The canal curves in the bottom right corner and Clayhanger Common takes the bulk of the shot in the bottom left with the ‘black tarmac path’ snaking from the spot and disappearing to the left. Clayhanger from the east looking west towards Pelsall. Walsall Wood behind. Image kindly by P Hummings. Bridge Street leading out of Clayhanger down the centre of the shot. Jones’ House to the bottom left and the New Pool where once there were tennis courts just creeping out of shot to the left. Clayhanger Common to the right with the New Village in two distinct blocks to the top right. Holy Trinity School playground can just be made out in the top centre and Pelsall is just visible in the sun set. Clayhanger looking south towards Rushall and Walsall Town. Behind is the Tesco store at Brownhills. Image kindly by P Hummings. Clayhanger Common in it’s entirity! The black tarmac path running across the middle of the shot with The Spot to the right. The New Village is just creeping into shot, middle right, with the Old Village above it. Centre top is the Maybrook Industrial Estate and Walsall Wood to the top left. Some may scoff or giggle, but I declare Clayhanger a place of beauty – the camera never lies they say – and I feel blessed to call it my home. Clayhanger Community Spring Clean: Saturday 19th March. The Clayhanger Community Spring Clean is set for Saturday 19th March 2016, 8.30 – 10.30 am at the Co-op car park on Clayhanger Lane. The Co-op car park is a high usage area and is prone to litter. Staff at the Co-op do their bit to help keep it clear but litter often gets stuck in the shrubs and under-growth. A Co-op Community Champion will be there to help out on the day with the litter pick. Should a large number of volunteers arrive, then we can always spread out to other areas in the village. Laura Terry of Area Partnership, Walsall Council, has already got the Clean and Green Team primed to provide us with litter pickers and bags. The rubbish bagged up will all be collected by Clean and Green at the end of the pick. I hope that this will be the first of regular litter picks in Clayhanger. If you are concerned about litter in a specific area of the village, please complete the feedback form below and this area will be considered for the next litter pick. The Thread of Life – Walsall Silver Thread Project. You know what it’s like – lazily scrolling through Facebook and something catches your eye. For me, it was the Silver Thread Tapestries Project. The crafter in me was gripped. A year long project, with funding from the Arts Council, to celebrate 25 Years of delivering community arts in Walsall. A tapestry representing all the areas, towns and holes in the hedge in Walsall. It gets better, local history and anthropology. Unfortunately, I’ve discovered this project at the end of a long haul of meetings and discussion groups. Undeterred, I get in touch anyway and Kate Goodall, Senior Directorate Support Officer at Walsall Council, calls me back. She tells me about the tapestry and, at the moment, ideas are being collected for each of the 11 pieces which will make up the whole. Kate’s looking for representations from each area, so for Brownhills and Clayhanger there is mining, the canal, the common. For Willenhall, locks and keys – you get the idea. Winding through each of the 11 representations, there will be a silver thread – highlighting the water on the canal, the glint of coal, the polished metal of a lock. I really would like to be involved in this project and Kate assures me that there will be a range of skill sets involved and enough tasks for everyone who wants to be involved, even if they do not have needle work skills. It’s not too late for Clayhanger to be involved, put forward ideas and be part of the project. Kate suggests that if there is enough interest, she would be happy to meet up at the community centre at a time which suits the majority. Time is of the essence. If there is interest within Clayhanger to be part of the Silver Thread Tapestry, we need to meet Kate in the next week or so. If this is something you would Like to do, complete the feedback form. Northfields Way – final public consultation session this evening. Clayhanger Methodist Church, 5.30 – 7.30 pm, Monday 7th March 2016. This evening brings the second of the public consultation sessions into erecting barriers on Northfileds Way. The purpose of the barriers is to bar vehicular access and halt the escalation of illegal encampments, loitering and antisocial behaviour recently seen along this stretch of road. The plans for the barriers seem robust and clearly thought out, however, Area Partnership would very much like you to contribute your ideas and views. Laura Terry, of Area Partnership, leads the drop in session and is very approachable and knowledgeable. A warm welcome is guaranteed. Amongst the ideas already discussed are speed bumps, a raised central area to stop corner cutting and dog waste bins. If you would like to lend your support to these ideas or offer more of your own, be sure to do so as this evening is the last opportunity to have your say before formal proceedings begin. Image a photograph of the draft plan for Northfields Way, taken by madwblog. Yesterday evening (29th February 2016) brought the first of two community consultations on the proposed barriers for Northfields Way. The second is to be held at Clayhanger Methodist Church on Clayhanger Lane on Monday 7th March 2016, 5.30 – 7.30 pm. The drop in session is extremely informative and I would urge any Clayhanger resident to attend if you are able. Laura Terry, Area Manager for Brownhills, Pelsall, Rushall-Shelfield Area Partnership, leads the drop-in sessions with a warm, reassuring welcome and a highly professional manner. This lady has the answers to your questions and some that you didn’t know you needed to ask! Laura begins by explaining that Area Partnership have taken the decision to come straight to Clayhanger residents with the plan rather than working through locally elected members. She explains that with elections coming up, the proposed plan could be used to gain votes and advantage for a candidate. I’m glad she’s noticed – I like this lady. Laura talks through the plan, explaining that this has been drawn up by Highway Engineers (got the proper boys on the job) and is, in the Council’s view, the best solution with the budget allocated. Laura explains that it’s a question of priorities, “What is the biggest problem that you want to stop?” she asks. The small group of four of us huddled around the table agree that it’s vehicles and illegal encampments. It becomes obvious to us that concrete blocks – although unsightly – are the only solution. Laura encourages us to talk through our ideas – trees, planters, metal fencing – but all, unfortunately, are no match for the determined illegal encamper. Laura knows. She’s seen it. Our little ‘committee’ of four have more ideas too. Again, Laura encourages us to record these on the feedback sheets. Anything is up for discussion and Laura indicates that asking for more money should not stop us asking for further improvements to the plan. We discuss dog waste bins, traffic calming and ways to prevent the cutting of the corner into Allerdale Road. With the eye of a teacher, Laura makes sure we have written all our ideas down. The ‘committee’ of four discuss our ideas and record them on the feedback sheet. PC Nicholls has also came along to the session and chats with us about the role of the Police in ASB and what happens when we dial 101. “All calls are logged,” he explains and a pattern of behaviour can be seen. Laura agrees. She urges us to always call the Community Safety Unit, as well as 101, to report any nuisance or ASB issues. The more calls that are logged, she says, the higher priority an area becomes – this attracts budget allocation to help with issues. I ask Laura if there is a timescale to completing the process and getting the barriers installed. She is unable to say, but assures us that as soon as the next drop-in session next Monday is complete, she will collate the proposals residents have made and pass them onto the Highways Department later next week. From there, a formal consultation will begin to close the road. So no definite date, but we are much further forward than we were at the beginning of February when there seemed to be no definite plan for the barriers. Now at least we know we are going to get them. An hour later, another resident arrives and even though there is only a few minutes of the session left, Laura greets the gentleman with unhurried enthusiasm. It’s been an extremely informative and fruitful session. I have come away feeling confident that Laura will collate our ideas and pass them on to the Highways Department who will then re-draft the plan if necessary and begin the formal consultation to close Northfields Way at the junction with Allerdale Road.